Volume Discounts - Buy More & Save! Maximum Continuous Length: Approximately 100 Yards, when ordering more than 100 Yards please note it may come in more than one piece. 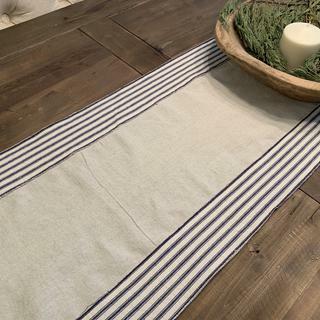 This 100% cotton ticking is durable and fashionable at the same time. It features dark blue stripes on a natural background and can be used in many different applications. Home decorating enthusiasts will enjoy using this timeless fabric for casual window treatments, durable bedding, creative table linens, and even for upholstered pieces such as arm chairs, seat cushions, ottomans, and throw pillows! Crafters will appreciate the strength and durability of ticking fabric for tote bags and carryalls, colorful aprons, appliance covers, quilts, lampshades, and many, many other projects. to replace old ticking on feathered pillows. Need a good quality ticking fabric to cover our feather bed. Modern farmhouse curtains. Found some curtains $140 A Pannel with the exact same print as this. Now I can make 7 panels for under $100! I’ve been looking for this for a long time. The price is good. blue ticking fabric. I think it would be durable and snappy looking. my wife loved the fabric for bedroom curtains in country home. This is fabric I use regularly for making aprons, and I am very happy to find it at a much better price from you than I have been able to get anywhere else. I am having a western themed party and this seemed like a good material to use as a tablecloth. The price was reasonable and the free shipping sold me on it. I am making replacement cushions for a sofa. A dog “played” with a cushion and it went into the trash. This fabric looks like a good color match for the replacements. On line Fabric Store is prompt at filling my orders so I knew who to choose for this fabric. I've been looking for this fabric and it was easy to order from Online Fabric Store which also had it for a reasonable price. This is true cotton ticking : the blue stripes are woven into the fabric. I ordered a sample to see and was so glad to find a place online that had it at such a great price! I am using this for a wedding. To go in my kitchen as drapes. 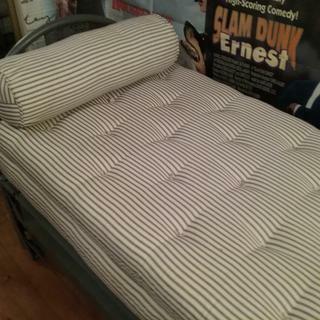 Making vintage look mattress covers for a vintage daybed. To re-upholster a chair, for a classic look. I liked that it's real woven ticking, not printed. This is exactly what I was looking for! This ticking stripe is back in style but hard to find for some reason. I’m glad you had it and at a very reasonable price. The price was the best that I found on and off-line. I plan to use this fabric for aprons and appliqué projects. It has been a challenge to find, so am happy to have discovered it here and at a very reasonable price. 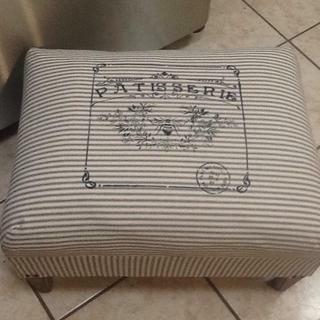 It's perfect for my farmhouse dining room cushions! I make our pillows! This is the same fabric my grandma's pillows were made from (and she was born in 1892). It holds up well, it's washable and makes us smile when we see it. I'm making casual drapes for a study. I have some blue ticking drapes in another room, which I love, but the company I bought them from is no longer in business. I love ticking and I keep coming back for more. If the fabric is as good as the reviews, I'll be more than happy. Looked to be exactly what I was looking for at a very good price. I’m making aprons with this lovely fabric. My local supplier isn’t making it anymore and am happy to have found it on here! It's exactly what I wanted and the price was right!! Needed ticking to cover mattresses and pillowcases for a production of the musical Annie. Was looking for the cheapest option that would look good on-stage. It s the material I want and it was a good price. I've used this ticking as lining for all my purses and it looks great, wears well and allows people to see right to the bottom of their purse. Hoping to use this for reproduction mattresses for museums..
What is the weight if this fabric? I would like to make a duvet cover from it. BEST ANSWER: This fabric is 7 oz per square yard. BEST ANSWER: It's what I would call medium weight fabric. It was 100% cotton and it DID shrink a lot when washed and dried. So I decided not to wash and dry it. I made curtains for a boat that was turned into a Boat and Breakfast. The curtains turned out great. Is this fabric made in the USA? BEST ANSWER: This ticking is not made in the USA. 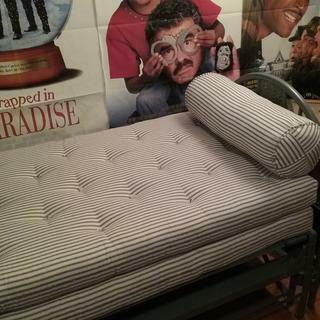 Is the stripe woven into the fabric, or just printed onto the fabric? The stripe is woven in this fabric. 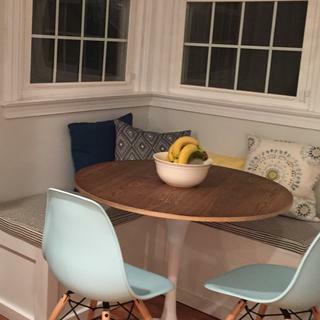 would this fabric be good to cover the seat of dining room chairs for a beach house? BEST ANSWER: Yes, I think it would work well. I would probably spray the finished seats with Scotchguard. I am looking for actual ticking for feather pillows. Is this fabric actual ticking or just ticking patterned? Is this fabric waterproof for bedding? BEST ANSWER: I’m not sure because I used the fabric for drapes, but I don’t believe it’s waterproof. No, not at all. It’s a medium weight 100% cotton. No, it’s cotton so is definitely not waterproof. Would this fabric be good for dining room windows? Fabric to go to the floor, so if they shrink when dry cleaned, should I go longer in length? BEST ANSWER: I think it depends on your dining room style. If it is very casual, country, distressed wood table, etc this fabric would be fine. Remember it IS old fashioned mattress ticking. It has to be lined. I used it for outdoor, in the woods table cloths. I washed it and it did shrink. Never dry cleaned it. I assume it won’t shrink when dry cleaned. I would recommend getting a sample. The white is actually an egg shell not a true white. It is a good heavier weight fabric so it drapes nicely but the color was an issue did not work for my project. BEST ANSWER: You should probably get a sample first. I think this is the ticking I sent back as I didn't like it , and it would have been very thick for a quilt backing. It might be too heavy for a quilt back, it is very close to the density of denim. BEST ANSWER: My particular dye lot (received 11/2017) is what I would call a classic blue stripe against an off white background. At the time, I also ordered a sample of Black Woven Ticking (S-WOVBLA).It is a true black stripe against a white background. This next part wont help much but I also ordered a ACA Blue Ticking (product no. 171513). It is very dark navy stripe by comparison against an off white background. However, I cannot find that Item number now so they must be out of stock on no longer offering it. Both fabrics seem good quality as does the sample. they actually have a black ticking, if you want that, but I would say this is a more gray/blue..it's not a bright navy blue at all. can you tell be how many inches between each stripe? how many inches is the white/ cream colored stripe? The cream colored stripe is 1/4 of an inch wide. Can this be used as apparel fabric or is it too thick? BEST ANSWER: I hate to be vague but I guess it would depend on what you plan on making I think it would be suitable for a shirt or a lightweight jacket. I believe it’s too thick. THE STRIPES GO VERTICAL, RIGHT? I AM CONFUSED BY THE "HORIZONTAL REPEAT" COMMENT. Yes, the stripes are vertical. I can't tell from looking online. Is the background color more natural or white? BEST ANSWER: More natural but not too "brown." is this a heavy fabric or can be used in quilt? BEST ANSWER: It is a medium weight fabric that is typically used for upholstery purposes. It may not be suitable for a quilt but there's really nothing stopping you from using it in one if you wanted to! For this, we recommend ordering a sample first before committing to a larger order. This fabric is not heavy and would be great for a quilt. Would this material be suitable for making an apron? Yes, this fabric would work for an apron. Will this fabric be good to cover an arm chair? Is this fabric stiff in texture? ? BEST ANSWER: It had the usual sizing when it arrived. I wanted it softer, so a wash took care of that - will be quilting with mine. It is on the firm side. We recommend ordering a sample to be sure that it will work for your project. is this twill or woven? BEST ANSWER: I would compare it to heavy jeans fabric. This ticking has a twill weave. Is your ACA Ticking fabric sutable for apparel, like pants or jackets? BEST ANSWER: We believe this fabric is too thick and stiff, but you can order a sample if you want to see if it will work. BEST ANSWER: We recommend ordering a sample to be sure that it will work for your project. Is this fabric too heavy to cut bias trim from it?It would be used as a trim. BEST ANSWER: We don't think so, but we recommend ordering a sample to be sure that it will work for your project. I have coonhound who digs into her beds and eventually tears the fabric and pulls out all the stuffing. I need a super strong fabric that would be almost impossible to tear. What would you recommend? Is this wide enough for a queen duvet? BEST ANSWER: This fabric is only 47" wide. You'd need to attach a few panels together for a queen duvet. Should this be presented before use for shrinkage? BEST ANSWER: We recommend pre-washing, yes. How much do I need for two large heirloom down pillows? BEST ANSWER: What size are they? I would guess 2 yards would be fine, but I can't say for certain without the pillow size. Is this featherproof like the 32" version also on this site? BEST ANSWER: That is correct, the only difference is the width. Do you have black and white ticking? is this a heavier fabric than the waverly ticking? BEST ANSWER: The Waverly ticking is decorative, so if you need the strength of ticking, this is the better option. Exactly what I was looking for. The color is more of a cream than stark white and the stripe is a dark navy. 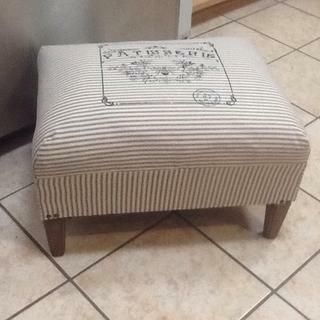 I used this fabric to make a box seat cushion cover for the kitchen. Finally found real ticking! 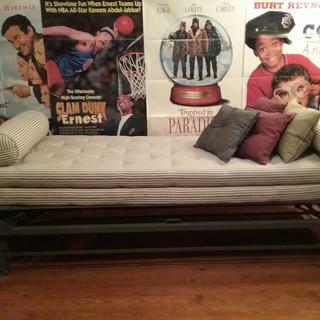 Worked wonderfully for the vintage look mattresses I wanted for an old daybed. Nice price too! Wish it was available in a rust colored stripe for curtains I want to make. Might not drape well but would insulate well. This is authentic mattress ticking, judging from the sturdiness of this fabric. But beware of shrinkage if you wash it. I allowed 4 inches for shrinkage for my 2.8-yard drapery panels. Then to be safe, I ordered an extra yard. Be prepared to lose 3" inches lengthwise per yard. I folded the fabric flat to minimize wrinkles and let it soak a few hours in cold water with Woolite in the bathtub. I hung it to drip dry. After hitting the fabric with a steam iron, it looked as good as it did coming off the bolt. Excellent fabric for the price, even though there were a few slight flaws in the weaving. Great quality fabric, just right for toss and bed pillows. Excellent good quality. Recommended. For curtains and large projects, I would pre-shrink it first, preferably at the dry cleaners, or gentle cycle in the machine, but would play safe, and buy extra fabric at time of purchase. This fabric is slightly thinner than the 32 inch and the navy stripe is not quite as dark. The stripe is also slightly wider. That being said...once washed and dried it felt soft and the weave actually tightened up so looked more robust. I would not order it again though as too much work to make it look good. Love this fabric! 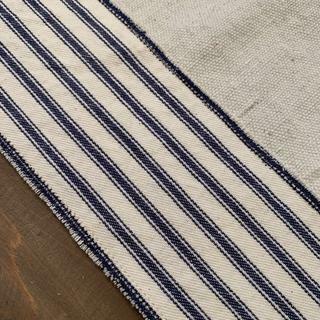 It looks just like the ticking stripe that is so popular right now but also has that farmhouse charm. I do recommend prewashing before cutting the size of your project. It does shrink a bit and gets extremely “stringy”. This is as expected but just a heads up. I washed and dried it to preshrink then trimmed all the strings before cutting to the dimensions I needed. It was exactly what I was wanting. Our table runners turned out great! I wish I could attach a pic to show you. The item was exactly as I ordered. I will order from here again. 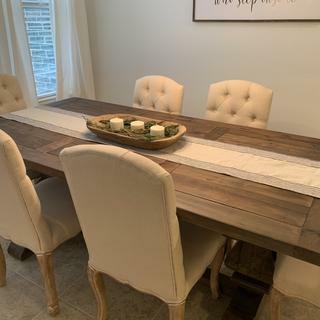 This is my new favorite material to upholster farmhouse items. I also use this when making doll bed mattresses, aprons. and various other farmhouse items. Love it and easy to work with. This discount is already applied to your order. Taxes, Shipping Fees, and Discounts will be applied during the checkout process. WARNING: This product contains a chemical known to the State of California to cause cancer, reproductive toxicity, birth defects or other reproductive harm. For more information visit www.P65Warnings.ca.gov. Free shipping on orders of $60.00 or more to the contiguous United States. All orders qualify for $7.49 flat rate shipping on orders less than $60.00 to the contiguous United States. *P.O. box, International, HI, AK, and expedited services do not apply. Any customer who is dissatisfied with a purchase may receive a refund or store credit on fabric. All retuned items must be in original unused condition and not cut or altered by the customer. Returns must be received within 30 days of the ship date. Restrictions apply to some products. Certain products cannot be returned. See our Shipping & Return Policy for more information. Many items on OnlineFabricStore.net can be ordered as 4" x 4" samples. Click the "Add Sample" button to add a sample to your cart. If there is no button, we do not offer samples for that item. Shipping is free for domestic U.S. sample orders, which ship via USPS. Canadian sample orders have a $1.00 shipping fee. All other destinations have a $3.00 shipping fee. Next-Day sample shipping is available for an additional cost.